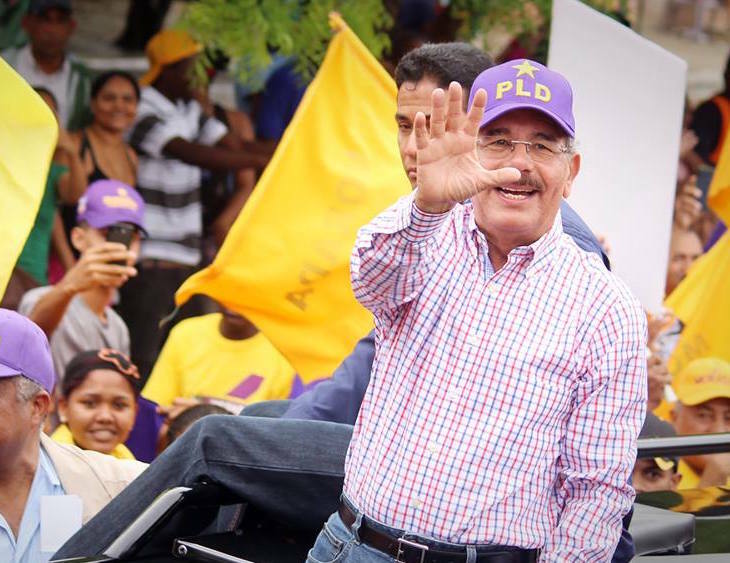 No one should be surprised that Danilo Medina has easily coasted to reelection in the Dominican Republic’s general election on Sunday. As the incumbent president in a country that registered 7% GDP growth last year, Medina is one of the most popular leaders in Latin America or, indeed, even the world. Preliminary results gave Medina over 60% of the vote in Sunday’s general election, with just around 36% for center-right challenger Luis Abinader, a businessman who has never held elective office. But the real victory for Medina came last year, in June 2015, when he successfully pushed to amend the constitution to allow Dominican presidents to run for reelection. His predecessor, Leonel Fernández, won reelection in 2008 only after the Dominican Congreso Nacional (National Congress) passed a similar law. It later revoked that law in 2010, however, once again forbidding consecutive reelection. Fernández, who was first elected to the presidency in 1996, had long been the driving force of the governing Partido de la Liberación Dominicana (PLD, Dominican Liberation Party), which has now extended a period of rule that began with Fernández’s return to the presidency in 2004. When Medina narrowly won the 2012 election, he did so in large part because of Fernández’s enduring popularity. Medina’s running mate, Margarita Cedeño, is Fernández’s wife, and it was widely assumed that Fernández would try for a fourth term again in 2016. Fernández opposed last year’s constitutional changes, alternatively arguing that they should be subject to popular referendum. Medina’s push, coupled with a reform to harmonize legislative and presidential voting in the same general election, effectively sidelined the former president, cementing Medina as the central figure in Dominican politics and paving the way forward for his successful reelection bid this year. Medina has had the good luck of such breakneck economic growth in his first term, boosted by growing tourism revenues, that he hasn’t had to make the kinds of tradeoffs common to most political leaders. That’s meant that Medina has lowered the country’s budget deficits, creating goodwill among international investors, while distributing more government resources to the country’s poorest residents and for well-funded health and education programs in the Dominican Republic — with nearly 10 million people, the Caribbean’s third-most populous country. He’s also popular with the electorate as a relatable and understated official who, for the last four years, has travelled the country as a way of keeping in touch with voters’ concerns, which clearly paid off with his landslide victory. With easily over 50% of the vote, Medina will avoid a June runoff against Abinader. It hasn’t been a perfect four years. Voters still rank violent crime as a top concern, and ongoing doubts about corruption haven’t abated, though Medina’s reputation is far cleaner than Fernández’s. Amazingly, Medina’s Brazilian campaign manager was embroiled in the growing Brazilian scandal over bribes from oil giant Petrobras that, in part, led to Dilma Rousseff’s removal from office last week. In his second term, Medina will hope that his government’s efforts to build more power capability will end long-running blackouts. Medina controversially endorsed the expulsion last year of tens of thousands of Dominicans born to Haitian parents, only the latest in a long-fraught relationship between the two countries that share the island of Hispaniola that include a 2004 law that revoked birthright citizenship in the Dominican Republic. Medina’s efforts have only helped to cast more doubt on the nationality of many Dominicans of Haitian descent who, in many cases, had never set foot on Haitian soil and who speak Spanish, not French or Haitian Creole. Though human rights groups have denounced the Medina government’s actions, they are fully supported by Abinader and the opposition, and anti-Haitian positions are wildly popular in political terms. Nevertheless, it’s an uncharitable, decidedly un-neighborly, and arguably racist policy. Dominicans of Haitian descent, now forced to leave the Dominican Republic, are being foisted on a far poorer country and a government struggling to conduct elections, let alone transcend the still-devastating effects of the 2010 earthquake that struck Port-au-Prince, the Haitian capital. Abinader was the candidate of the nominally progressive Partido Revolucionario Moderno (PRM, Modern Revolutionary Party), a party that came into existence only in 2014 as the merger of Abinader’s minor party with many leaders of the Partido Revolucionario Dominicano (PRD, Dominican Revolutionary Party), formerly the chief opposition party in the Dominican Republic. Abinader’s running mate, Carolina Mejía, is the daughter of former president Hipólito Mejía, who narrowly lost the 2012 election under the PRD banner. Voters on Sunday were also electing all 32 members of the Senado (Senate), the upper house of the Congress, and all 190 members of the Cámara de Diputados (Chamber of Deputies), the lower house. Going into the election, the PLD held a slight majority in the Chamber of Deputies, and it seemed set to extend its grip. After the most recent 2010 elections, the PLD held 31 of 32 seats in the Senate. Under the constitutional reforms, the terms of both houses were extended for two years so that the presidential and legislative elections could be held simultaneously in 2016.